What is Bostin' ? | Great Midlands Cycle Routes | Bostin' Rides Online booking for our 2019 events are now OPEN! Enter online now! For anybody outside of the pocket of south Staffordshire, north Worcestershire and north west Warwickshire that form the modern West Midlands, bostin' may be a completely unknown word. So where does the word come from? The late Ted Walker, a proud Wednesbury man, compiled The Definitive Black Country Dictionary in 1996. Ted was co-founder of Wednesbury Civic Society in 1951, an ex-Tipton Harrier, and treasurer of Wednesbury Amateur Boxing Club for many years. He was committed to the well being of the Black Country and the recognition of its dialect and history. His book was deeply researched and it is an important work that deserves greater attention. Ted traced the origins of many Black Country words to Anglo-Saxon, or Old English as it is also called. For example, wammel, meaning a mongrel dog, comes from hwaemelec; babby is from babban; mithered is derived from mythered; and wussa (as in ‘I ay wussa off’) harks back to wyrsa. As for bostin', Ted believed that it hails from bosten, signifying something to boast about. Now in the Black Country and Birmingham area bostin' is used as an adjective, meaning something very good or even fantastic, such as in “we had a bostin' time”. 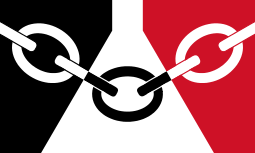 The flag of the Black Country was created in 2012 by a competition launched in response to a campaign by the Parliamentary Flags & Heraldry Committee, encouraging local communities to develop their own flags to celebrate the Diamond Jubilee of Elizabeth II and the United Kingdom's hosting of the Olympics during 2012. It reflects a quote made in 1862 by Elihu Burritt, the American Consul in Birmingham. He described the region as “black by day and red by night” — a result of the local furnaces giving out smoke and grime during the day and glowing by night. The flag background is therefore both black and red, with the chains showing a typical product manufactured in the area. The central white area represents the glass cone, a symbol of the region's glass-making heritage since 1790. The flag has influenced the design of the new Bostin' Ride Cycling Jerseys that are available to order online from our Shop.